Offering Commercial Electrical Services Ealing for business means J&J Richardson Electrical Ltd always understand your need for compliance with Electrical Safety and Wiring Regulations. We are committed to a professional and responsive service for all clients. 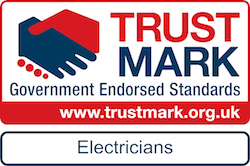 Being NICEIC Approved and TRUSTMARK endorsed we are equipped for all types of commercial electrical works. The Electricity at Work Regulations (1989), requires all electrical installations to be periodically tested for safety and compliance we can also offer a full range of electrical installation and maintenance services. All commercial and industrial buildings should be fitted with an Emergency Lighting System in case of emergency. We can install such systems, maintain, inspect, test and certificate so as they fully comply to current regulations. For all your business and commercial electrical services call J&J Richardson Electrical Ltd on 07876 611 756 or email us here. Quality and assured Commercial Electrical Services in Ealing.